Quite frankly, we were skeptical about the claims of this little device - the best coffee, ever? - until we tried it. WOW! The aeropress makes great coffee taste divine and average coffee taste great. We have now made coffee for ourselves and HUNDREDS of other people with the Aeropress. Regardless of what coffee we serve, it never fails to impress. The aeropress extracts full flavor without the familiar bitterness. In comparison to the average drip-brew, coffee from an aeropress is so smooth it is almost sweet. The aeropress works opposite from the more familiar french press. Rather than pushing the grounds down through the water and pouring the coffee off of the grounds, you push the water through the grounds and coffee goes directly into your cup. 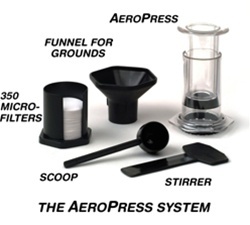 Watch the aeropress in action on the "Extra Info" tab! It is very simple to get one or two cups of excellent coffee. It takes just a little more time (about 4-7 minutes after the water is hot) and effort (a few pressings) to make a 12-cup carafe of american coffee. The exquisitely smooth flavor makes the minimal effort well worth it. Includes: stirrer, scoop, 350 filters, grounds funnel, and aeropress (plunger doubles as measuring cup). Make rich espresso or smooth American coffee. Extract the pure, clean flavor of your coffee without the bitterness.